Prof. CHEN Aicheng from Department of Chemistry, Lakehead University, Thunder Bay, Ontario, Canada was invited to visit Institute of Intelligent Machines (IIM), Hefei Institutes of Physical Science on June 20th. 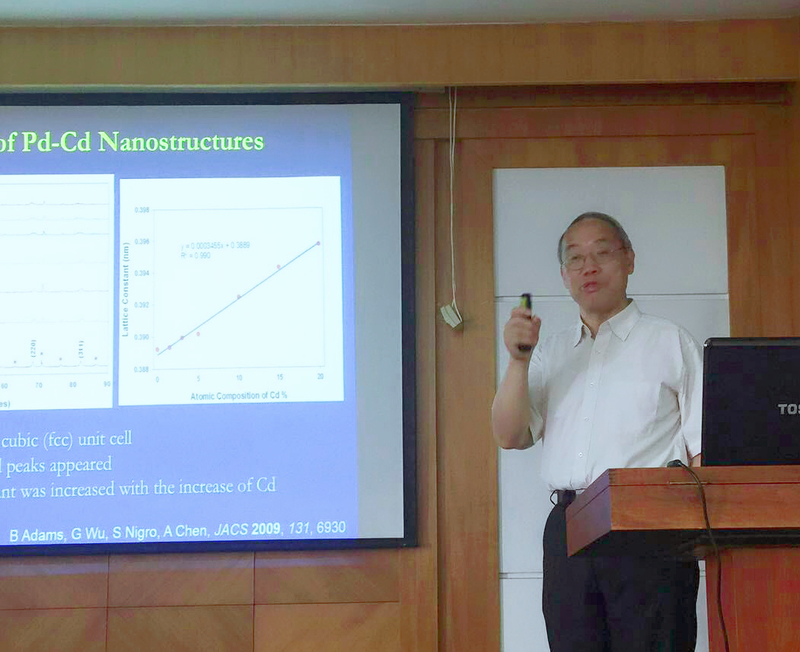 During his visit, he delivered a lecture with title “Design and Electrochemical Study of Nanomaterials for Green Chemistry and Biosensing Applications”, in which he briefly illustrated the electrocatalytic activity of Pd-based nanomaterials and graphene-based nanocomposites as well as the catalysis of TiO2-based nanostructured photocatalysts. Besides, he introduced several exceptional properties of Pd and its promising applications in hydrogen purification, storage and detection. According to his lecture, Prof. CHEN argues that Pd based nanomaterials play a significant role in facilitating the growth of a hydrogen economy. In addition, he pointed out TiO2 would be high-performance photocatalysts due to their non-toxicity, high catalytic activity and cost effectiveness. Finally, he talked about the development of nanomaterials based electrochemical biosensors for biological and medical applications. Prof. CHEN Aicheng is Canada Research Chair at the Department of Chemistry, Lakehead University in Canada. His research interests cover the areas of electrochemistry, green chemistry, biosensors, materials science and nanotechnology. By now, he has published 175 peer-reviewed journal articles, authored 100 industrial technical reports and delivered over 110 invited lectures. As a credit to his outstanding contribution, Prof. CHEN has received a number of research awards, including the Ontario Premier’s Research Excellence Award (2003), the Lash Miller Award of The Electrochemical Society Canadian Section (2009), the NSERC DAS Award (2010), the Keith Laidler Award of CSC (2012), the Lakehead University Distinguished Researcher Award (2013), the RBC Innovation Award (2015), and the W.A.E. McBryde Medal of CSC (2016).